I got involved with volunteering from an early age. It began in fourth year in school and since then I have never looked back. 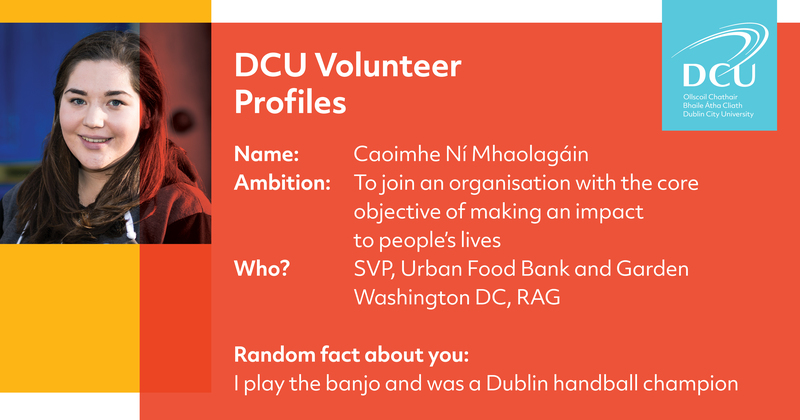 After finishing secondary school I wished to continue on with my work and searched for a charity group during both the Volunteer Fair and Clubs & Socs days.The DCU Raising and Giving Society were one of the first groups I talked to and from then I was in 100%. While I was on the Washington Ireland Program I had the opportunity to volunteer at the Urban Food Bank and Garden in the outskirts of D.C. I have been incredibly fortunate to be born into a family that love, support and care for me. I have never been in need of anything and am luckier than most. I wanted to be able to give back to the less fortunate, provide them with self belief and confidence in their abilities, so that one day they might be able to find a way out of their situation. In my first year I was lucky enough to be one of the founders of ‘Ballymunch’ a cooking programme for parents in Ballymun. Coming from the area some of the parents had ran the breakfast club in my primary school. It had a real impact on me that the people who had fed me in secondary school were availing of this social project and thus it all came full circle. You never truly know who is in need of help, the struggles they go through on a regular basis and the impact you have on others. The main thing to bear in mind is to be kind to one and all and be grateful for the life you live in comparison to others.